The Life of Bon: Well, I'll be darned! This week was the week that I had to go back to work. Wednesday, Thursday, and Friday were days chalked full of meetings, trainings, and more meetings. It wasn't until late Friday afternoon that I had a bit of time on my own. 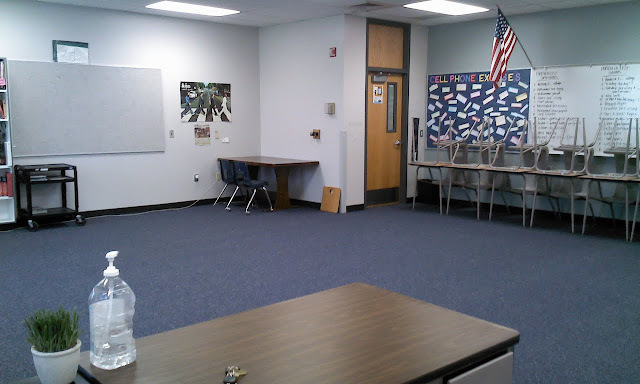 I returned to my classroom which I had so happily abandoned that first week of June. I booted up the old computer and checked out my class rolls for next year. This year my school is starting something called arena scheduling where the students choose their own teachers and their own class periods. They build their own schedules, very similar to how most of us probably picked out classes in college. Once a class is full, it is full, and students can no longer register for it. What this basically means is that any student who is in my class is a student who has deliberately chosen to be in my class. I am teaching classes of sophomores, juniors, and seniors. My junior and senior classes will have students who I have already taught before as lower classman. I wouldn't be speaking figuratively if I said that my jaw dropped when I saw my class lists. - A boy who maybe said three words the entire year. He didn't complete one assignment. He failed all four quarters. Every time I tried to talk to him after class about his grades he would look straight down and just nod or mutter one word responses. I absolutely could not reach him. Toward the end of the year he told me he didn't care to pass English and my energy would be better spent on kids who care. - A kid who literally slept every day in my class. Literally. Every day. -A girl who I had to tell numerous times to pull up her top because of cleavage. It got so bad that one day that I sent her down to the principal's office for a new shirt to cover her up. She stared ice daggers into my soul that day. -A painfully shy boy who cried silent tears when I pulled him out to the hall and told him he wouldn't be receiving credit on his test because I had caught him cheating. I thought for sure I had humiliated him to the point of no return. -This kid who told me to "F off" when I took away his cell phone. -A girl that I caught blatantly lying to me. I called home to tell her parents about it. She didn't sepak to me for a month after that. -A girl who begged me to let her hand in an extra project so that she could pass the class. I said no because she hadn't done all of the regular credit assignments in the class. She stormed out of the classroom and muttered curse words under her breath. She failed the class. -A kid who told me point blank that he thinks all the projects that I assign are lame and the books we read are boring. -A boy who tried to transfer out of my class mid year but couldn't, due to a fluke in the counselling system. I feel like there is some kind of lesson to be learned in this, even though I'm not quite sure what it is. Something about not knowing the effect that we are having on others even when it appears that we not making a difference. All of these students I was certain I would never see again, that I had not reached them, that I had not met their needs. I thought I had failed these students. That I hadn't been a good enough teacher for them- that they hated me, that I had bored them, that I had treated them unfaily. And yet they have voluntarily chosen to be in my class again. I guess when it comes down to it, we really can't tell how big the impact is that we unknowingly have on others. And that is enough to make me all sorts of excited to start another year. I hope you have a great year! We start back today, as well, but it's the week of meetings :). I have some students again this year too, but for different reasons. I moved up two grades, so those kids have involuntarily been assigned to my class. I'm wondering if they know it's me or think it's someone else with my name. If they knew it was me, would they try to transfer out? I guess I will only know come next week when we meet again. High school can be difficult and kids are so hard to reach these days. But, I'm so glad that you are going to get to start school in a positive attitude! P.S. - My senior year I decided to be different that all my other piers and take advanced classes instead of just taking what I had to take and then filling with my schedule with things like art. I slept entirely through my Calculus class every day - and it was with my favorite teacher. Better the devil you know than the one you don't know? You have no idea how much I needed this today. So far in the youth ministry world at my church - we have not had a very good start to the school year. If you had asked me about 5 minutes ago I would have told you that all of the teenagers hate me and are never returning to youth group again and I haven't done a single good thing for them. So this reminder that you never know what's going on in their heads/hearts was much needed. That is a really cool way for those kids to register. I teach 8th grade and our kids ALWAYS come back to visit when they are in high school. Like you said, there are the ones you would expect to see, but then there are ones that come say hi, leave notes etc. for me that I am shocked by. I try to remember that during the school year. Have a great day back! That is always surprising to see who "secretly" liked you all along who was just putting on a show, or hey maybe they liked that you cared enough about them and their education that you were tough on them. Also I know when I was choosing my classes for college I know I didn't get to take all the classes I wanted because they either were at the same time as a class I needed or had to take, or were full already, or sometimes I took classes because my study-buddy friends were in them and I knew it would be easier to take the class my friends were in for homework and note taking sake. Wow! Good luck today ;) I know you won't need it. What grade do you teach? Seems like an interesting way to have the kids choose classes. I would wonder who would choose me? lol. Looking forward to following your blog! That's crazy! Well, it's a little humorous. And you're right, you did make an impact in those kid's lives. That scheduling thing just adds a whoooole nother dimension to high school. wow! Even with these crazy kids... I still want to go back for my teaching degree... REALLY bad. I just found your blog and I love this! I know that for me, sometimes the teachers that I butted heads with the most were the ones who I knew actually gave a crap about me and my success. If they didn't care, they wouldn't have challenged me or held high expectations of me. They may have frustrated me at the time but I respect those teachers more than the ones who took zero notice of me. You have more of an impact that you'll ever know! Have a great new year!